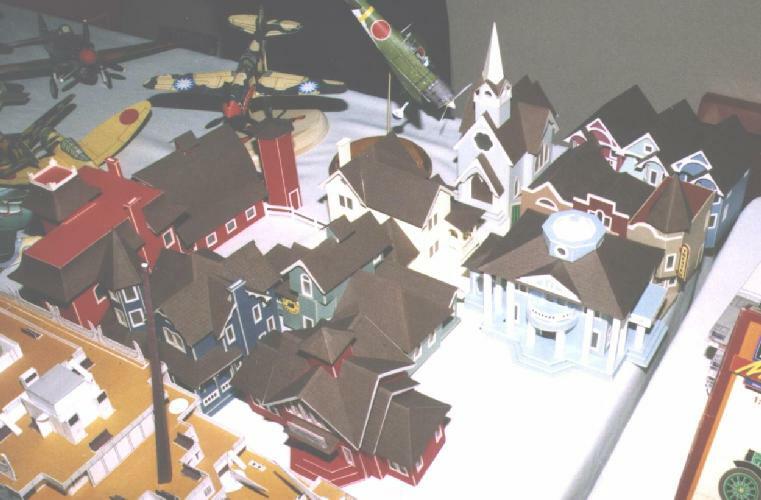 The 2nd International Paper Modeler's Convention was held on October 3rd and 4th, 1998, at the Holiday Inn in Miamisburg, Ohio. Attendance was good, a big step up from our modest beginnings at the 1997 convention (the Gang of Four.) We hope that the 1999 convention will be bigger still. Kell Black brought some of the smaller models from the traveling exhibit organized by members of the Cardmodel-L Internet mailing list. 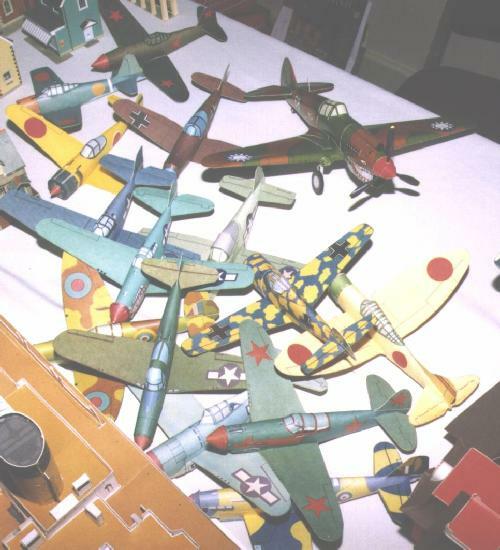 Shown are models by Rob Tauxe, Peter Visser, Clark Britton, Bob Bell, Louis Van Winkle, and others. Thanks to Bill O'Neill for providing the quarter in the center of the picture for scale. 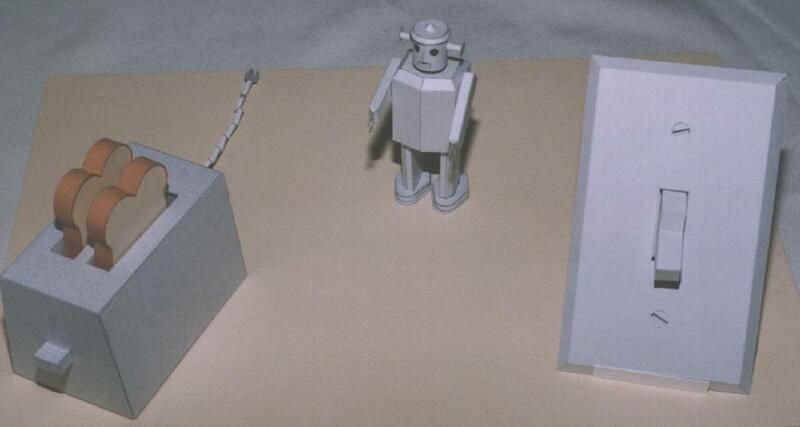 Kell also exhibited some of his own models, including small models of a toaster, robot, and light switch, and some larger models. 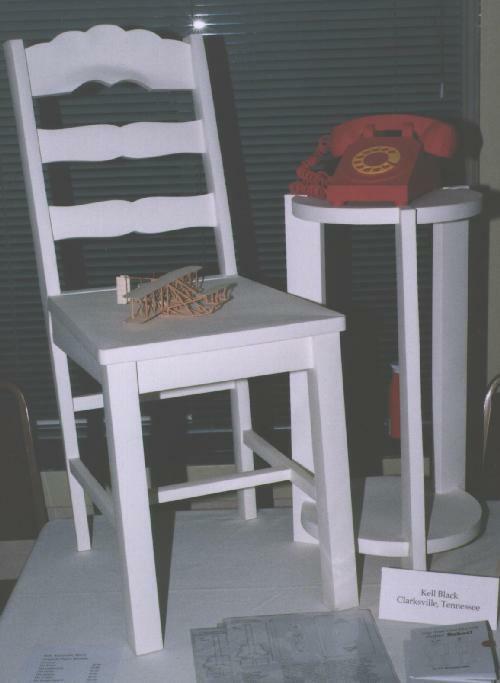 Yes, the chair and the table under the telephone are made of paper, as is the telephone. On the chair is a Wright brothers airplane. 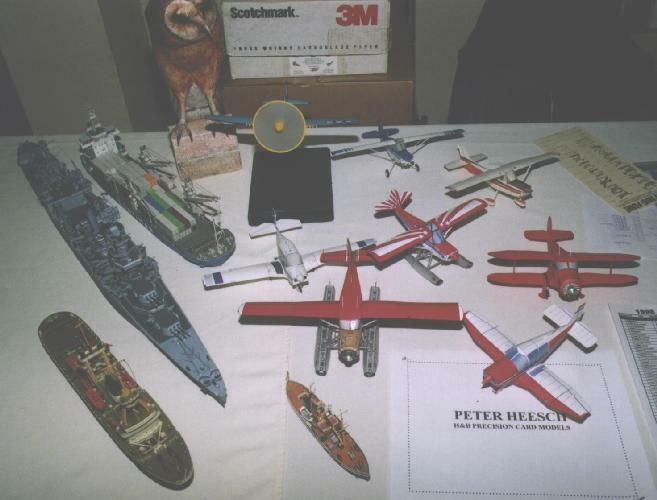 Peter Heesch, of H&B Precision Card Models, displayed airplanes from the Promotional models line, ships from the Wilhelmshaven line, and an owl from the LS line. Robert J Miller displayed a Wilhelmshaven Z1 destroyer and Jaguar torpedo boat, far right. In the foreground is a floatplane from the Wilhelmshaven DKM Scharnhorst. He also displayed the Wilhelmshaven ME-262. The ships, including the floatplane, are 1:250; the ME-262 is 1:50. One of the highlights of the convention was Robert Orlando's Taschen Titanic. 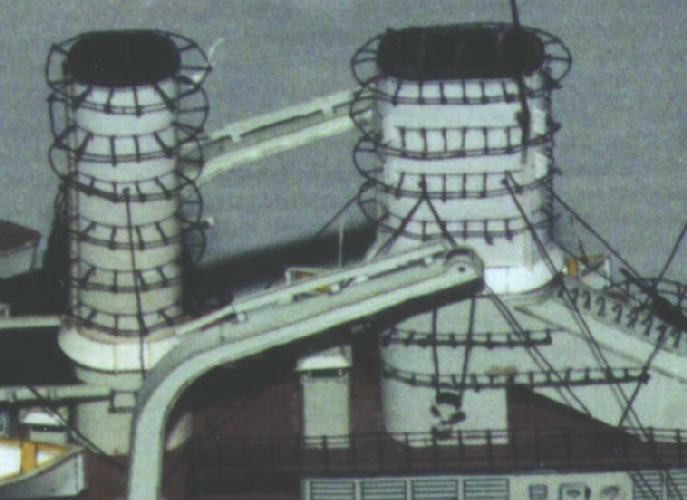 The 1:200 scale model is large and striking. 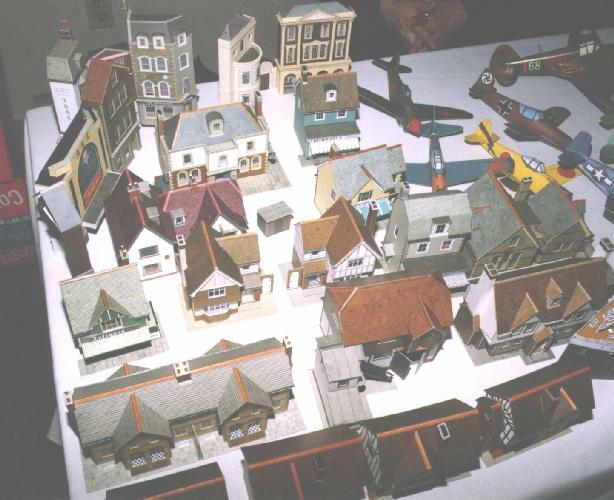 Robert also brought numerous buildings. 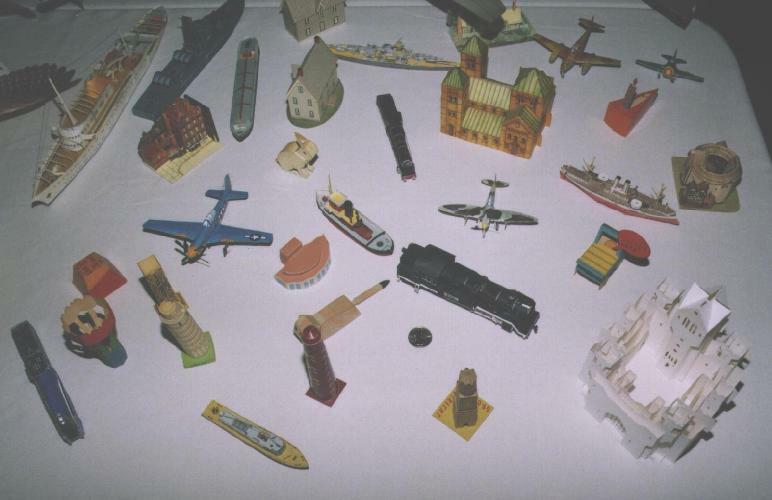 To the left is an assortment of models from the SuperQuick line, die-cut in 1:72 scale. Some of the SuperQuick models are from the 'low relief' series. To the right are some Fairmont/Hill models. 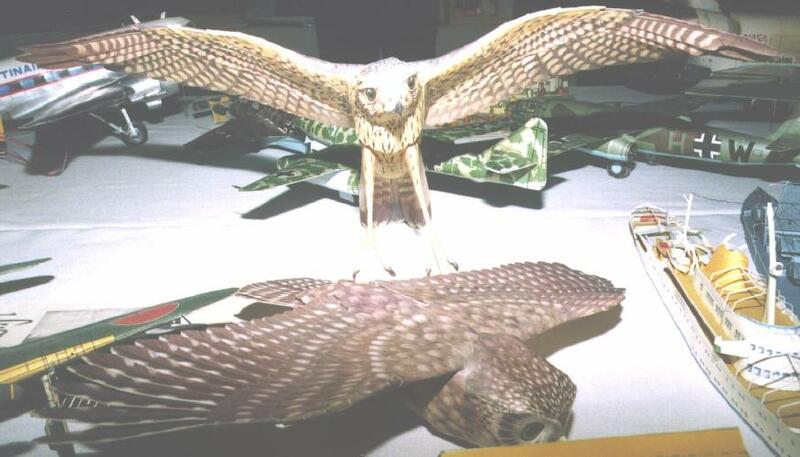 These are also die-cut kits, in HO scale. Among all the buildings and behind the Titanic was displayed a complete set of reproductions of the WWII Jack Armstrong penny weight airplanes. 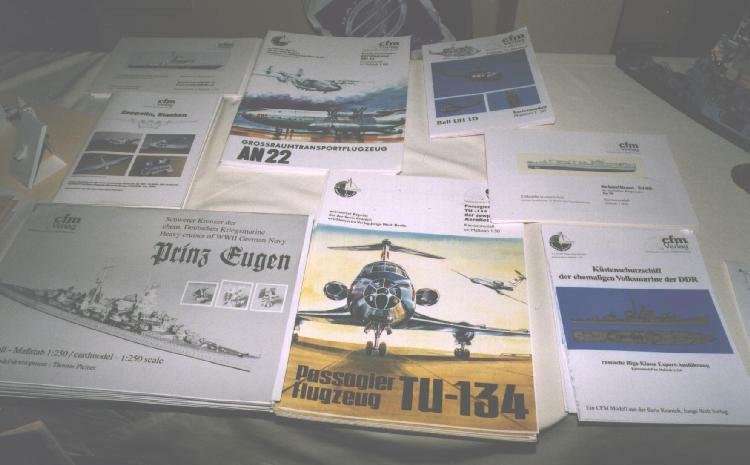 Thomas Pleiner brought a selection of CFM models from Germany to display and sell. 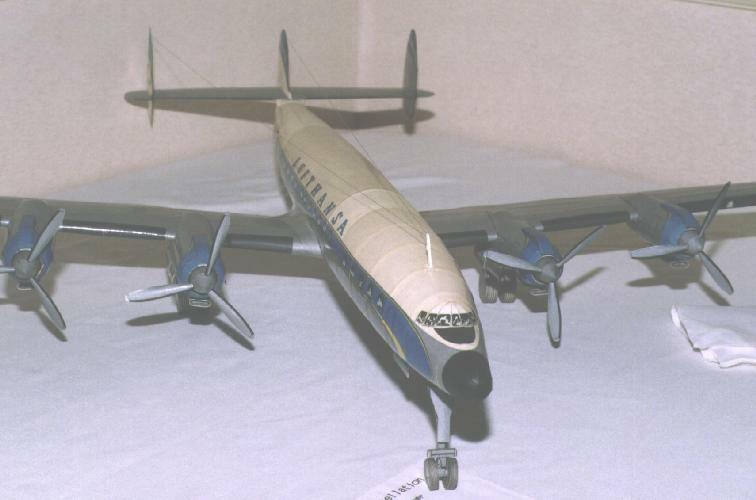 His Lockheed 1649 Super Star Constellation (from the JF Schreiber model in 1:50 scale) also has motorized props and can run from the same battery truck. 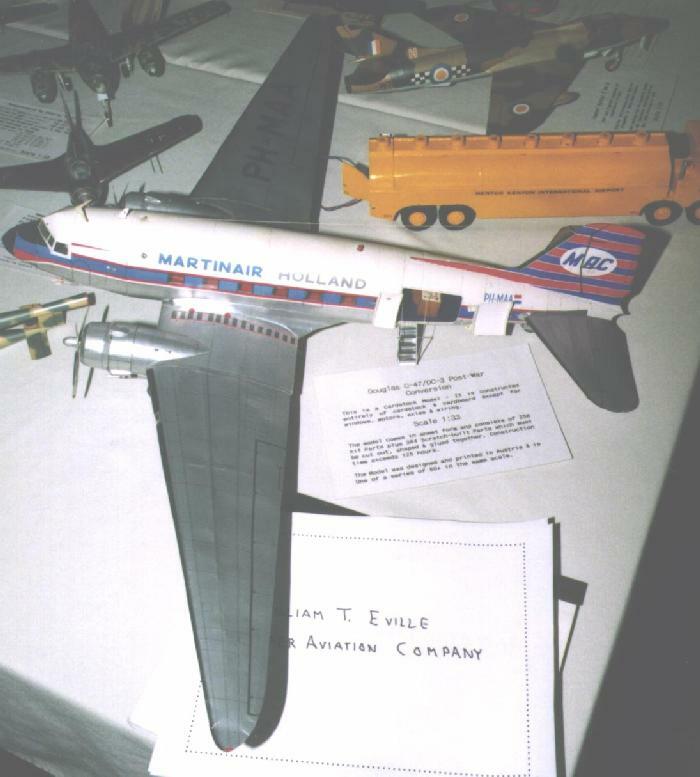 A 1:72 DC-10 from the LS kit and a Space Shuttle rounded out Bill's collection of large aircraft. 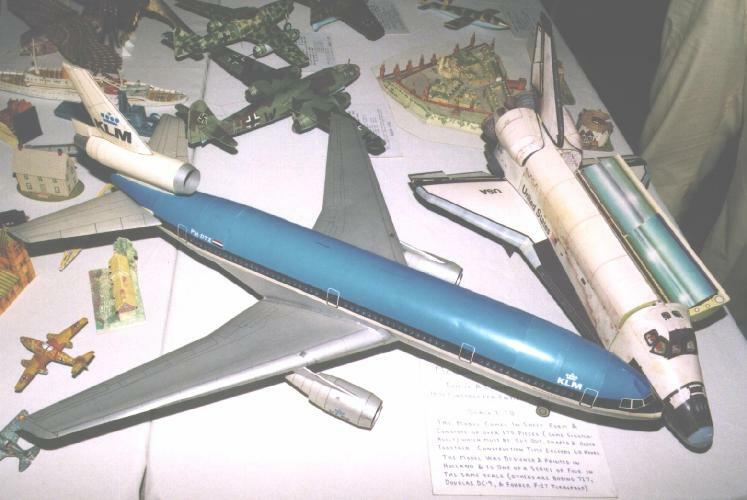 The Lufthansa DC-10 shown here was also featured on page 47 of the July 1996 issue of Fine Scale Modeler. Behind the Space Shuttle is the Perigee Kremlin and several Micromodels built by Myles Mandel. Surrounding the Kremlin are several more of Bill Eville's models, all from Geli kits. 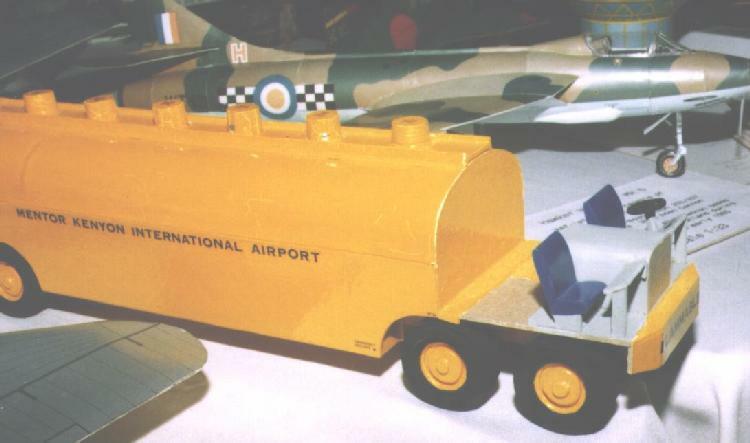 Under the DC-10 tailplane are some of the models from the Cardmodel-L traveling exhibit. Bill doesn't exclusively build aircraft. 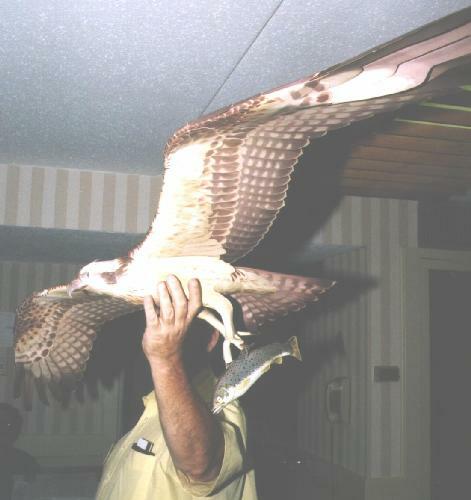 He's shown here holding the Birdmobile Osprey, and he also displayed the Birdmobile Kestrel and Little Owl. Bill O'Neill displayed this Mini-Mansions kit of the John Muir house (the great naturalist and redwood saver) in Martinez, California. These kits were done in the late'60's -mid'70's by an architect and his wife, Roy and Jacqueline Killeen, at that time in San Francisco. 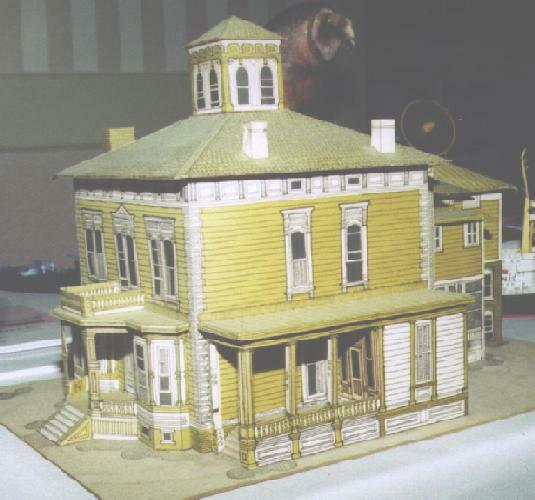 Most were 1/4" (1:48) scale, but the Muir House is 3/16" (1:64) scale. Joe Bloom displayed this Hooton Hawker Hart J 9941. 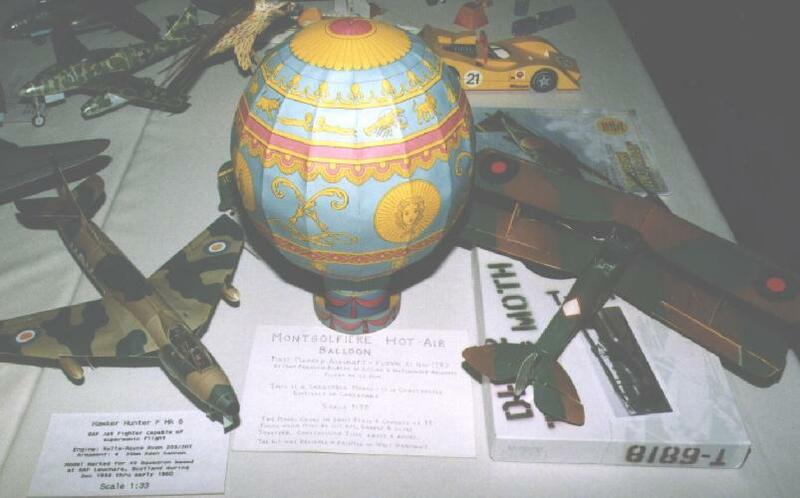 This particular model was built by the designer, Peter Richardson of Hooton Aircraft.